In August of 2014, I walked into a room where I knew only a handful of people, desperately tried to pretend like I didn't work a wedding late the night before and then spend all day in the car to get there. As I stumbled my way over to the coffee cart, I wondered if I had made the right decision to come there that day. I had left behind an eighteen month old daughter, a wedding season that had been beautiful but brutal on my mind, heart and body, and a to do list two miles long for what was coming. I was drowning in the reality of motherhood and business ownership. I didn't remember what it felt like to not just be moving from the next demand of each day to the next, and living in survival mode. But here I was, in this ridiculously gorgeous setting in Jekyll Island, Georgia, attending, what I thought would be, if I'm honest, just a wedding vendor conference. I thought there would be good things to learn, pretty things to see, fun flowers to play in (my dear friend/travel buddy/fellow coffee addict and I were going to do flowers for some of the events), good food to eat, and maybe, just maybe, I would justify the stress I was under, with some gained knowledge that would help me feel like I was still in the business and wasn't a total failure in this part of my world, let alone the "life" part, no matter how true that felt. "Businesses functioning in chaos keeps from working with purpose... Clarity leads to purposeful opportunities, which leads to better judgement, which leads to better time management, which leads to strong boundaries... You are NOT a 24 hour a day business, and if you are, you are not going to be happy." I was floored. Someone knew my pain and was sharing theirs. But not only were they sharing truth with me and making me feel just a little less crazy, they were going to impart their hard earned wisdom with me with practical steps to try and apply what they were sharing. This wasn't just another wedding conference. Cultivate Retreat was all ready, in the first five minutes, what creator and founder Cassie Cherneski promoted it to be: "an experience that allows you to withdraw, focus, [and] get clarity." (source) It became an opportunity to intentionally press in to the life of my business. To see that I was drowning, and life as I knew it, personally and professionally couldn't go on like this. It was time to cultivate, work, and unearth what had to go in order for me, the business owner, to survive, and make room for some new and amazing things to grow. One month from today, I will be joining a group of wedding professionals in the mountains of North Carolina for Cultivate 2016. Cassie and her team have an incredible speaker team lined up, in a gorgeous setting at the Historic Old Edwards Inn! I am going with eager anticipation, ready to dive in and make room for more cultivating in my life and in my business. While I'm there, I will also have the great privilege of leading a breakout session that ultimately will serve as an incredible full circle moment for me. I am going to share a lot of the insights that I have gleaned and gathered (and am honestly still working out!) since those special days at Cultivate 2014 about work- life balance and heart-care. I'm so excited I can hardly sit still! That's me, crazy, stupid, happy and feeling more free than I had in months on the last days of Cultivate 2014 in Jekyll Island, Georgia. Are you signed up to go to Cultivate? If so, let's connect! I would love to meet you! If you are not signed up, the formal registration has closed. BUT! (You read that right, there's a but!) I have it under good authority that if there is someone who was waiting and held out just a little too long, if you reach out hello(at)cultivateretreat(dot)come and state your case... there may be one special spot left just for you! Don't wait. Its going to be an amazing week, and I would so love to sit under the shady trees of the Appalachian Mountains and have a cup of coffee with you as we even attempt to digest all the goodness that will come out of Cultivate 2016. Hi, my name is Emily and I am an over apologizer. I walk into so many conversations feeling like I need to explain myself and my failures before anyone can even get a word out. “Here's why you haven't heard from me in so long,” or “here's 100 reasons why I feel like I'm a failure.” That's all I can think of as I try to start writing again, that I need to explain why its been a while. But you know what? The Lord is teaching me about my weaknesses. He is teaching me about surrendering my weaknesses to Him and about how He makes Himself known in my limits. Limits are not bad, even if they're frustrating to a perfectionist with unrealistic expectations on herself. Limits are necessary. I just have to figure out how to function in them in a God honoring way, and not in a life draining and soul scorching way. Can anyone relate? If you can, here's my hug and cheers with a coffee mug to you. Just keep going. Don't quit. Both Lauren and Audrey were engaged for longer periods of time. Audrey was right at a year, and Lauren was more like eighteen months. Both offered great insight about the blessings that can come to have the time to prepare for marriage but also to make some tough choices that come with wedding planning. You can save money for things you would like to have for the wedding. Lauren in particular knew there were a few things she really wanted for the wedding, but she would not be able to wisely invest in them right off. She prioritized on the things she knew they absolutely had to have in order to take care of their guests, and then the other things, such as speciality lighting and having a videographer, came later as she and her fiance were able to save for them. In the end, she was so happy with this decision and felt it added to her overall experience. You can have more time to make the tough decisions. Audrey and her fiance's family are from the same town and are very well known and loved in the community in which they lived. When they first sat down and made their guest list, it was overwhelming in size. As much as they wanted to be able to have everyone there, they also knew that they had two limits: a stewarded budget and venue capacity. Audrey and her family were able to intentionally take the time to go through their guest list and make (all be it hard) decisions that ended up giving them more breathing room in their budget. There were still sacrifices that had to be made, but again, with the time on their side, they were able to wrestle through those decisions and ultimately come to a peaceful place and move forward with great joy and anticipation. I love that both of these women talked about how much they want to encourage Brides to intentionally invest in a photographer. I'm married to a photographer/videographer (outside of the wedding world) and he and I literally bonded over our love of capturing moments in time. To me (in my humble opinion) other than a planner, a photographer is the most important vendor you hire. They are the guardian of your memories. And for both of these women, that was a significant decision for them as well. In the end, only weeks after Audrey's wedding, about the time the sneak peeks at the wedding photos even began, they experienced a great loss in her family. But during this time of loss, there were beautiful photos of their family together and celebrating her marriage with great joy. And suddenly, its more than just pictures, its memories that are treasured forever. This is just one reason why they personally implore you invest time in finding the right photographer for you. -Don't just plan your wedding, be engaged. Both of these women shared several stories with me about how they grew as people and how their relationships grew as their weddings approached. There was much to talk about. There was much to learn. Even people like Audrey and Patrick who had grown up together, there was still more to learn and talk about. For Lauren and Henry, they had met later in their life, which can be such a blessing because you are more confident in who you are, but there is so much more to work through as you learn how to share your life. Ultimately, I think the resounding message is this: whether you are engaged for three months or eighteen months; be engaged. Don't just plan a wedding, be engaged. Spend time together doing things that are not wedding related. Do pre-marital counseling. Don't be afraid to talk about hard things. And don't assume you know everything there is to know about each other... we're talking about a lifetime here. If there wasn't more to learn, what fun would that be? I'm looking forward to having more “coffee talk” with women who have stories to tell. We all have one, and there is so much good that comes from being willing to invite others in to learn from their journeys. This is where I want to apologize for not having more of these conversations yet, that I was hoping to do this once a month and two have happened in six months, but you know what. They happened. And they were so good. And that's exciting. The rest, I surrender. Have a great rest of your week, y'all! Hi friends. Its been a while! I have been trying to figure out how to pick up where I left off. I had such a clear vision in January about where I was going as a person and also in my business and the message I felt that I wanted to share and invite people to be a part of. I knew that the Lord had given me a word about acts of intention. That I would need to learn this lesson personally and also surrender to Him in the process. I recognized my life was full of haphazard choices and just trying to keep up with all of it. Life. Business. Motherhood. Everything. I actually had the awesome opportunity to speak to a group of wedding planners about balance as business owners and some of the things that had been really poignant to me in the midst of all the new, and a few days after that, I completely crashed. I mean just emotionally CRASHED. And I got the flu. On a destination wedding week. Yeah. So lot of things happened and then honestly nothing happened all at the same time. Ultimately, I came to the conclusion in coffee shop in Savannah, GA that I felt as though my words and my vision of what I thought the Lord had given me for moving forward had been compromised. It took almost a whole month for me to sort through what was truth and what was a lie in the midst of that, and it totally rocked me for the better, but when I began to resurface, I just didn't know how to start over. Yesterday, a fellow wedding planner, Kristin Kaplan put out a periscope that I feel like really sealed some of my thoughts about what happened to me. (And also, K, it made me feel so much less alone, thank you for sharing!!) She shared a lot about how to respond to being overwhelmed, particularly in the social media/communication part of this world and sort of wanted to give her followers permission to take break. I think for me, as I look back, that was the crux. I was overwhelmed, even in a good way, but I couldn't keep up with my own expectations for myself and the plans I had made, even if they were good plans, I was coming apart at the seams in all the plans. Now I didn't have a nervous breakdown or anything, life went on as normal and everything is OK, my heart was just in a very confused state. For some reason, hearing her say “its OK to take break” almost made me look back on the last couple of months with fresh eyes. I think I had seen my silence as a failure. But instead, it was a much needed space for me to intentionally choose the best yes (as Lysa TerKeurst would say) for my business, my family, and my calling. I feel much less scattered now. The issue is still ever before me, but the Lord is literally revolutionizing how I plan my days. Its an act of intention in itself. And its really, really helped me be better at my job, be a better wife, mother, and I hope a better friend. I'm learning so much, and sometimes I still get overwhelmed in the the learning and like Kristin mentioned yesterday, the information coming at you like crazy can be so intense it knocks you off your feet. BUT. I'm also learning about where to place the boundaries in my life, even on the things I take in. The information I take in and learn from, even it has to have a limit. I can only do so much with so much. I'm a part of writing class right now being taught by Ann Swindell and she said something last night in class that has really stuck with me. She said “You don't have to fit a mold, you just have to obey the Father.” And I love that. I find a lot of freedom in that. I had made a mold, all be it a well intentioned mold, a mold that was holding me captive nonetheless. All that God asks me to bring is what I have to give. Which is me. My minutes, my hours, my to do lists, all of it. He just asks that I come as I am. And He will reveal to me how to best steward what I give Him. So that's what I'm doing and what I've been up to! And also why all the silence =) I just didn't know how to start over! My husband travels for a living and in the first few years of our marriage, we quickly discovered how challenging it is to be out of your normal environment and then try to go back to “normal.” Its that period of time between his coming home and both of our adjustment to his presence again. We call it re-entry. You can also think about it in light of being out of town for a trip and then having to come back to your reality. That's re-entry. So. Here I go, this is my attempt at re-entry in the Periscope/social media world. In other news, wedding season is well under way! We have all ready had some amazing events over the last 3 months and another one is coming up this Saturday! I'm so fortunate to do what I do and stand in the sacred space of bearing witness to two people becoming one and then celebrating it like crazy. Be sure you are following along on our instagram (@simplyyoursweddings) or even our snapchat (@simplyyoursem) to see the beautiful images and just fun things the Lord is doing in the Simply Yours life. Hope you guys have a great rest of your day! Did you know that Sunday is Easter? It crept up on me too. I've been wondering how it has snuck up on me like this, why I was missing it, and as I got to thinking about it, this is where I landed: How can I hear and see that the King is coming amidst all this noise? I don't have to tell you or anyone that we are surrounded by a ton of pain. So much pain that we are a country that stands deeply divided about who can save us from ourselves. This morning, the whole world woke up to the news that bombs went off amongst a very busy metro and airport in Brussels. We are so much more accustomed to receiving bad news that we don't know whatgood news sounds like. Its all just noise. We long for distraction from what confuses and hurts us, so we immerse ourselves into things that are fun, but temporary. We move from high to high, where we live for the moment and wait, with incredibly shaky anticipation, for the next whistle. And then what? More noise. No politician, no team, no diet, no hit of caffeine, no distraction, no perfect idea or expectation; none of that can truly "fix" us or save us. Those in ancient Jerusalem were not so different from us. We just celebrated Palm Sunday. The day that marks Jesus' entrance into Jerusalem, where He was greeted by a people desperate for Him to save them from all that ailed them, and begins what we know now as Holy Week. Their world was seriously broken and run by a corrupt government, just like ours. People were suffering all around them, just like us. And their lives were consumed by the noise of economical progress, entertainment and unrealistic expectations of a community confused by culture vs religion, and each man dictated for himself what was wrong and right. Just like us. But It came down to this. Nothing could save them from what truly ailed them but the blood of Jesus. The same is true for us. When Jesus went into Jerusalem amidst the shouting and the palm branch waving, He set into motion a series of events that would lead to Him giving up His life for a world that did not want Him. He then would revolutionize the ideas of even those who thought they knew Him by rising from the dead three days later. We were given a Messiah who gave us a merciful gift we could never earn, deserve or find for ourselves. By His sacrifice, He arrested death and made a new way for a life of hope on Earth and a life that's everlasting in Heaven. This past Saturday, my small group from church spent an entire day sharing our life stories so that we could know each other more intentionally. I think that was the moment that I truly soaked in that it is indeed Holy Week. Listening to these people that I love bare their souls about where they have been and where they continue to struggle, and to confess that the noise surrounding them so often drowns out what they know to be true... It was such an incredibly beautiful picture of why we TRULY need a Savior. It was a reminder that we are at war with the noise of a world that wants nothing but answers and comfort, at war with a dark and spiritual world that wants nothing but our destruction and our distraction, and we are in desperate need of Truth to permeate every part of our days. We have been given a gift in Jesus' death and resurrection to find true life in the midst of it of the chaos by His Holy Spirit. We have been given life support in the flesh by the opportunities to share life together amongst other believers and cling to Jesus' Word and His unchanging promises. This is what we truly need to hear. And not just during Holy Week, but always. Its not small. Its not trivial. Its real. Even in the midst of things that seem larger than life, there is all ready Someone who is larger and stronger than life or death. He is alive! Death is arrested. And this is not how the story ends. If you are like me and need something that can penetrate the noise to bring in some Truth, I've made a playlist (naturally). I remember when I was young, my Grandmother would ask me "how can you think/focus with all that noise?" But to me, music isn't noise. Music is a form of life support to help me shift my thoughts into place. So what better way to move the Truth of Jesus' amazing gift of Himself to the forefront of my mind, than drowning out the ugly noise with my joyful noise! Today is the first day of Spring. However, I don't know about where you live, but here in Middle Tennessee it does NOT feel like Spring today. There is a biting wind whipping through the cold air and we are even under a sever freeze warning for the weekend. I froze in February. It wasn't just because of the cold, it was me. I froze. I had some amazing things happen in February. I had my first official speaking gig, I was a part of an amazing destination wedding, and I also helped produce a massive fundraising banquet for a ministry that matters greatly to me and my family. But in the midst of it, I got terribly lost. My heart was all over the place. Anxiety and doubt was keeping me awake at night. I was really frustrated that all of my grand ideas about carrying out the work I began in January were stalling. I wasn't living up to my unrealistic expectations I placed on myself, or even the realistic ones, for that matter, and I was drowning in a sea of confusion. I couldn't even find the words to communicate what was happening to me. My words felt compromised. My vision seemed blurry. I felt I had completely mis-read what I was supposed to doing. I just completely froze. While I was in Savannah, I finally heard the Lord speak into my fear. I felt the paralysis begin to thaw. And I started to see the light that was coming. And I knew in my heart, I would not stay in the winter. However, here we are today, its the first day of Spring and it doesn't feel like we want it to. We are in danger of freezing over again. But it doesn't change the fact that today marks the first day of Spring. So despite how it feels, the truth remains unchanged. Where do you need it to be Spring in your life? Where do you need to live outside of how it feels? Whether you need to circle the truth on your calendar in bright red marker (remind yourself that YES indeed it is the first day of Spring and winter is ending!) or whether your heart needs re-focusing on the things that are unchanging about your business/work/calling, your family, your body, your heart, can you take 5 minutes to gift that to yourself today? Put it in front of you where you will be reminded outside of what your heart and mind, and even the temperature, says. Winter is over. You are alive. And you still have something to say, a work to do, and something only YOU can give to each day. The Lord is funny in how He tells a story. That's the only way I know how to even begin. Walking into this year, from the very first moment I had a distinct inclination that I was on the brink of a season of learning like I had never experienced before. I think ultimately, that was and remains to be the heart behind the acts of intention project. I think I wanted to sew seeds into my life so that whatever I was going to learn would have a place to start. And let me just say, its been quite a ride. A lot of people have asked me how the project is going, mostly because I think I've been rather silent on the social media front. I think the best way I know how to answer that is, it is definitely going. Going so much I haven't had a real opportunity to use my words the way I would like to over social media. Which when you're trying to walk through a social media driven project, that gets a bit messy, but like I said, God is the one who decided He has a story to tell and things for me to learn. On our first pass with the snow, there was a break in between the slight dusting and the "holy snow, Batman" we were hit with a day later. I was driving to a meeting near Vanderbilt University's campus. It had all ready been an insane week. My email was FINALLY fixed after 10 days of being messed up, I was short on focused work time and heavy on things that required my attention. My heart was overwhelmed, concerned I was all ready failing everyone in my sphere of influence, and I was late to this meeting. As I was sitting at a stop light, I saw this guy running in the snow. He was clearly not a seasoned runner and in a lot of discomfort and pain. For some reason, out of the depths of my soul, I had this overwhelming desire to roll down the window and say "Don't stop! Keep going! Don't give up!" As I continued to drive, the image of the runner was all over me. Why had this struck such a chord in my hurried heart? Why the desire to emphatically cheer on a stranger? As I thought more about it, I think it was because that was the perfect image of how I currently felt. That I was running hard after a new way of living my life and it was not coming easily and it was pushing me and it hurt. I realized that because my days were not going the way I wanted, I wanted to quit. I struggle so badly with perfectionism. I put my own spin on it and call it doing things well, but its just plain old crippling perfectionism. If I'm not doing something well, if its not matching up to what I think is good enough, or even intentional enough, I want to stop doing it so I don't ruin it. But as I watched that runner, as I saw him press on, in horrible weather for seasoned runners, let alone a newcomer, I saw that the Lord was telling me to press on, to press in, to persevere. Perseverance is not a pursuit of perfection, its a constant, intentional choice not to give up. Its finding the small victories in the midst of a botched plan. Its soaking in the lessons as they all unfold and believing that they are real and lasting even if they don't make it on to your Instagram feed and not one person knows what's happening. Its sowing seeds in faith and feeling the Living Water starting to make them grow because even when He doesn't have to send encouragement, He does. I’m not saying that I have this all together, that I have it made. But I am well on my way, reaching out for Christ, who has so wondrously reached out for me. Friends, don’t get me wrong: By no means do I count myself an expert in all of this, but I’ve got my eye on the goal, where God is beckoning us onward—to Jesus. I’m off and running, and I’m not turning back. So all that is to say, I'm still here. I'm still up to my eyeballs in this. There are ideas that I thought were what this project's focus was meant to be that I believe still are, but I think the Lord has expanded it past the start of a new year and a new season. Its opened up my eyes to the process of perseverance and the need to intentionally choose to engage it. And just because the momentum has slowed, doesn't mean I'm down for the count. The race isn't finished. There's more to come. I can't promise it'll be all wrapped up and pretty and on the schedule I set for it, but I'm grateful for a place to share it. So what about you? On this last Friday in January, where are you? How's your heart? Whatever it is, the Lord doesn't ask us to come perfectly, He just asks us not to give up. I hope your first two weeks of 2016 have been lovely! There's been a whole lot happening here in our world as we try to get things rolling in the new brand, diving into the #31actsofkindess project, embracing the start of engagement season with an email address that wasn't working until YESTERDAY, putting out my first Periscopes, and just living our life in the post holiday madness of finding "normal." I think one of the most interesting things about this acts of intentionality project is it doesn't have to a label for the project to be alive. Its been sweet to hear from those of you who have reached out to say "you may not see it, but I'm with you." There are such good seeds being sewn, friends. I think one of the most challenging things that I have experienced in this process is how much defeat and frustration I and others have all ready felt this year. Personally, I had a major low point the other day and really need to re-adjust in order to move on. I wrote down my thoughts about needing to marinate in Truth. We're not alone in it, friends. Its amazing in both of these places, the highs and the lows, I have all ready ridden a roller coaster of emotions and actively seen how much the Lord is going to push me into really learning about surrender and grace in this season. And we're only 14 days in. PS- The image above is from The Gluesticks Blog and she is offering some AWESOME (and free!) printable organizational tools to start your year off! Check it out! Here is a list of some of the resources I have mentioned a couple of times on Periscope and on Instagram and I've been promising I would post links to! I've quoted or referred to two different books quite a bit the last couple of weeks. Here is a link to both of those books where you can purchase them on Amazon. I cannot say enough incredible things about both of them! I've also linked to the authors Instagram handles for daily encouragement and general awesome-ness. You are not a failure, you are finite. You aren't going under for the year, you're only 12 days in. You can't change what you can't control. You are loved even if you are lonely. Have you ever had one of these days? Where everything feels zero to sixty? Where you move from "I'm OK this isn't that bad" to "THE SKY IS FALLING?" and you don't know how to make it stop? The lies. The intimidating beat down of unmet expectations where you suffocate grace and feed off of fear. I've sat white-knuckled in the car, willing myself not to let the tears that are building spill over. I've sat down and tried to breathe through the storm brewing in my heart and mind. I've sat down and made myself think about something. Anything other than how I'm feeling. Eventually, the clouds do break. And there is some sort of relief that comes. Most importantly, in the calming of the storm, you somehow remember that you will not always feel this way. What is true about the Lord and what is ultimately true about you exists outside of how you feel. But it doesn't burn out. Its a choice to taste and see in the burning. What does it mean to taste and see? What does it mean to burn through the night? What does it mean to gird oneself with strength? I think it begins with the Truth. And the truth that I know is written above, but is also penned through song. For me, there are many nights, that for me to keep burning and not to burn out, I have to bathe myself in spirit-led worship. If you're like me, I've made a playlist just for you. I also encourage you to look up and write down the scriptures above and keep them with you. Moses told the Israelites to literally write God's words on their walls and place them on their foreheads and bind them to their wrists so that the words of the Law would be cemented into their hearts and we would be able to share it from one generation to the next. (Deuteronomy 6:1-9) I love that the Lord knows us so well that He knows we need the truth to be that close to us to survive the storms of our own feelings. Deep breaths. Tomorrow is a new day. I'm so excited to share this project with you guys today. If you tuned in to any of my Periscope broadcasts yesterday, you heard a little bit about it, but if not, let's start from the beginning. The first week of January, we're excited about our fresh start and the newness and ready to burst into a new year. Which is very healthy I think. I think God knows us enough to know we need a re-set in our calendars. So we make our resolutions, we take the time to think about how to better ourselves and our businesses and get to it. And by week two or three, a lot of us are struggling to get through the day, let alone even attempt to get through our resolutions. This process by itself is NOT a bad one, so hear me say that. But we'll come back to how we can actually make things like this function realistically. I want the new start. I ache for the fresh chance. I feel personally that I am hard-wired for re-examination this time of year because my birthday falls in tandem with the New Year. However, I think each year, I get lots of grand ideas about how to make changes, and if I'm honest, I go into disaster prevention mode. I move pieces of my life around on a chess board and say, "OK if you can fix this, then this won't happen." Or "if you can lose x amount of pounds, you'll feel better about x." I weigh myself, find where I'm wanting, and then decide what failures I will attempt to prevent. I won't call them resolutions, but they make themselves on to a magic list and when they are not crossed off by the date I deem worthy, they are tossed in the trash and moved over into the column of shame. But does it sound familiar? -You'll fail at this too. Eventually this Fall I was given an opportunity to put my words and thoughts together and test the waters with some of these thoughts a bit with other women in my sphere of influence. As it turns out, I wasn't alone after all. There are a lot of us running around spinning too many plates, asking too much of ourselves, and setting unrealistic goals during all parts of the year. Well, for me, I want to try something new. And I would love for you to join me. This is what the 31 Acts of Intention Project is all about. Its about making intentional choices that can plant seeds into your daily routine, or even into your monthly routine, that would find roots and grow into a life that overflows with joy past the month of January. I want to sow generously with what I have to give, so that I may reap generously and ultimately, stop feeling like I'm just trying to survive the life I've been given. The 31 Acts of Intention Project is based around 4 sub-categories of sowing. Simply Yours, Simply Ours, Simply Family and Simply Community. Simply Yours: Ultimately, everything starts and ends with you. Your heart, your thoughts, your choices. How can we sow generously in other areas, if we don't start with sowing generously and intentionally into ourselves? Does the verbiage sound familiar? Its definitely not lost on me that we must sow to overflow. But what we are all ready filled with will be what continues to overflow and overwhelm. -Do one thing this week that makes me feel alive. I've made a list, I'm happy to share it with you, but some of those things are: read, work out, have a deep conversation with a friend, spend time in scripture and prayer. I know that because of the schedule this coming week, I may not be able to do ALL of these things, but I am hoping to achieve one. That's a much more realistic goal. -Drink a nalgene of water every day. Apparently, only drinking coffee is bad for you. Apparently. -Don't freak out that our Christmas decor is still up. Simply Ours: SO is for all of you who are currently in a relationship. Whether you just got engaged, are newly married, or have been married for several years, this is the area where you can be willing to learn and grow. I don't care if you've been married for 50 years, there is ALWAYS something to learn about yourself and how you function in this primary relationship AND something you can learn about your significant other. -Do one nice thing for your significant other, no matter how you feel about them. -Take Gary Chapman's Love Language test. I'm going to definitely talk about this later this month. Its a relationship game changer. Simply Family: SF is open ended to include your given family or the friends/significant relationships in your life that you consider to be like family. This one is super challenging in adulthood. Its heavy on my heart all the time. We need to reexamine our expectations about friendship and be willing to receive each other where we are in this season and not try to make old ways work in the new. Grace abounds, friends. -Schedule time with a friend. I don't care if its a Facetime session, a phone call, or if you're a lucky duck, face to face coffee talk, put it on the calendar. -When you think of a friend/family member, tell them. We are in constant communication with people. Whether its a Facebook post, a text message, whatever, don't wait to tell them you're thinking about them. Even if they don't answer, the heart is what matters. The connection is what matters. We have to get back to fostering our connections. -I feel that there are many, many people going through tough challenges in life: moving, new babies, divorce/break ups, loss of a loved one or caring for an ill loved one. Whatever the case may be, find one person in your life and ask them what they need. If they don't have an answer, a couple of sure-fire ways, if you have some cash to spare, is to either a) make, or pay for the delivery of, a meal for them or b) send them a cup of coffee. I learned this year that the Starbucks app allows you to send digital gift cards. How amazing is that? You may not be able to grab coffee, but you can send them a cup of comfort. Simply Community: I think giving back to our community can feel daunting and overwhelming at times. What does that mean? Do I have time for that? I don't have the money to spare. It doesn't have to be complicated or cost a dime, but its the most challenging and intentional choice to make because it calls us to be aware of others and not ourselves in situations that we would not ordinarily be so. -If you are involved in a church, a ministry or some kind of non-profit charity, do something to thank the staff. They give their lives away constantly and often thanklessly for the betterment of others. It doesn't matter if your child draws a craft, if you take cupcakes to staff meeting, or again, buy the coffee, offer a meal, ask them what they need; any of it will bless their socks off. -The next time you're in a public place, smile at everyone. -Hold open doors for people, be kind and courteous while you drive, let someone go in front of you. do something that is often against our nature and uncommon to experience for a stranger. This week on Periscope, Instagram and hopefully here on the blog (because again, realistic goals), I will go deeper into each of these categories and how they can be applied or get you started. I would welcome feedback about your ideas! My ideas are not the only ones out there. I can't wait to hear about how you guys apply this into your lives. There is NO pressure here, friends. This is not a to do list or a daunting challenge that is designed to set you up for failure. In my opinion, doing one thing a day for 31 days is not realistic. It very well may be for you! I can all ready own, that it is not for me and my family. BUT as I become more aware, especially by starting with the Simply Yours category, I know that the Lord will open my eyes to where else I can sow with intentional generosity. I would love for you to partner with me in this and document it on social media by using the hashtag #31actsofintention. It does not have to be a grand gesture. You saw my list! One of them is to drink water. How simple is that? Let's do this, friends. Not just because we feel like we have to, but because we were made for more than what we've been settling for. Happy new year! Thank you for stopping by to check out the new face of Simply Yours. I feel a little bit like a young girl walking into a new office in a place where she's worked for a long time. Same building, same view, same coffee in the break room, but entirely new world. When I started this company in February of 2008, I was 23 years old, fresh out of college and six months into marriage. I knew that I loved helping people, I loved being the one who could solve the problem with my Mary Poppins sense of readiness, and I knew that I loved weddings. Otherwise, I had a heck of a lot to learn about running a business, about the ins and outs of weddings, the nuances of how people function in relation to weddings, and how to develop my own sense of what made a wedding truly great. Not to mention, why someone should hire me to share any of that information and be able to tell them about it. Not only did the world grow and change, but Simply Yours has changed. For one, the name got shorter! It started out as Simply Yours Weddings & Etc. I think I was trying to be fancy. I started out as a one woman show, trying to do everything and be everywhere at once. There have been a number of fantastic guys and gals who have worked for me on my team, and we've grown now into a tight-knit family. 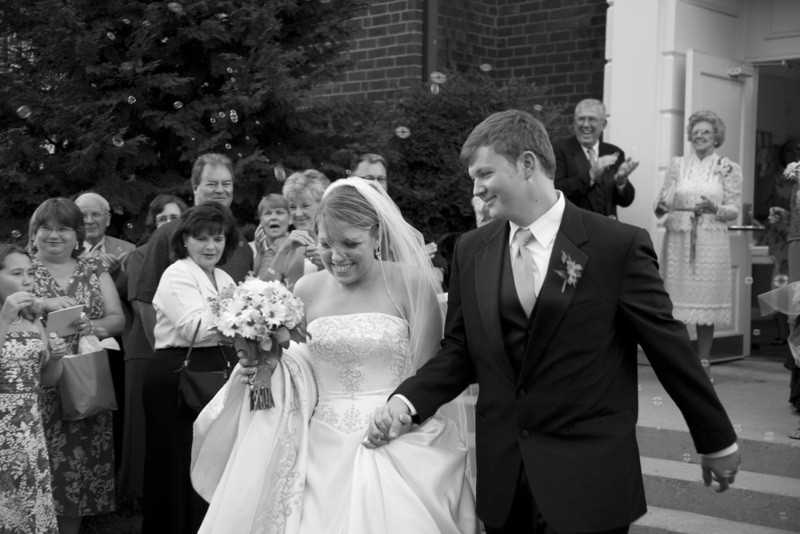 In the last 8 seasons, we have been a part of over 100 weddings. We have seen so many incredible Brides walk down the aisle, grooms beam as they greet them, first dances, hugs from proud families, happy tears, "we wish you were here" tears, an amazing variety of designs and tastes, colors and textures, and a world of personalities. On top of all of those changes, and a world of experiences, I have grown and changed. Andrew and I are now 8.5 years into marriage, we've lived in two apartments and house and now we are 3 years into the adventure that is parenting with a beautiful, hilarious and rather sassy little girl we are blessed to call ours. And today, I turn 31 years old. I think one of the biggest things that has changed in my life, and in turn in the life of Simply Yours, is not so much a change, but a growth. I started out pursuing this career because I really loved helping people and walking with them through what I saw as a challenging season in preparing for marriage, mostly because it was so fresh in my life. Not just because of what we walked through, but also what I was seeing in all of my friends. The joy, excitement, anticipation, constant ideas and big plans colliding with feelings of confusion, uncomfortable conversations about money and life merging, managing shifting family dynamics and reality checks. Over the years, I have seen all of these things and more. I've had meetings in hospital rooms, umpired a million arguments, dried 1,000 tears, held dozens of hands, and prayed an innumerable amount of prayers. What I didn't expect, was just how magnanimous the good stuff would be. The overwhelming satisfaction of bringing a dream design to fruition. The CAKE. (Just bein' honest!) But seriously... The happy tears of a proud parent. The equally hysterical and sentimental toast from the Bride's brother. The truly perfect look on a Groom's face when he sees His Bride for the first time. The Father/Daughter dance. The sacred moments right before I send the Bride down the aisle.... I never would have been able to anticipate the true privilege of bearing witness to these pieces of the lives of my clients. To all our Simply Yours family of the past 8 years... the pleasure has truly been mine. The new Simply Yours is not a source of major change, its a deepening of what we've always been. And I wanted to be provide us a home that could house all that we have been up until now, and allow us to put down roots for where I believe the Lord is calling us. I have had multiple veins of this calling going for a couple of years now, where I have been sharing with and helping others in the industry, or those trying to break into the industry. I've also been writing pretty much my entire life, but I've kept it hidden away from the world because honestly, it was scary to share. However, in the last year, I've been given so many opportunities and much support to pursue both of these things in addition to the ins and outs of doing what we do best for our Brides and deepening our knowledge to become better at what we all ready love to do. And now we have a home for all of it to live together in the same place, where all things Simply Yours: Weddings, Consulting and what I lovingly refer to as all my other Shenanigans, can live in harmony. I can't begin to describe how equally scary and awesome it feels to share it with you! Now. I know this post is all ready lengthy, but I want to wrap this up by inviting you to celebrate with me! In honor of the launch of the new Simply Yours home, and because its my birthday, I have a special project I've created to start the party! Its called #31actsofintention. Its going to be a project that's based on being intentional with the choices we make walking into the new year, not just making resolutions, but actually planting seeds that will take root and hopefully, grow all year long. I will elaborate more on it today via social media, particularly Periscope and Instagram so be sure you are following along! I will also dive into it more here in Simply Shenanigans as we get further into January. I just know I've babbled on too long all ready for one day =) I would love for you to join the party. Thank you for being here today. Thank you for reading. Just... thank you. I can't wait to see what happens next.